Credenza desks are a good option if you prefer more work-space in your offices or even at home. Let us see some of the best picks below! This shell desk is a reliable and durable desk for a working environment. With its 72w x 24d x 29h dimensions, the HON BL Credenza desk is made of sturdy, high-quality material to ensure that your office experience is made more accessible and more comfortable. This desk can be adjusted with the office’s pre-existing designs to create a U-shaped or L-shaped workstation. The HON BL is a budget-friendly and decent-looking desk that is made to look like a professional workspace. Also, it comes equipped with a five-year guarantee from the company. 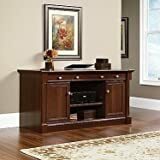 This Credenza Desk by Bush Furniture comes with an additional drawer which you can use as a keyboard tray and a laptop or other electronic storage, with ball-bearing glides on the drawer. The legs of this credenza desk are made up of sturdy and robust material, which a unique and attractive design. 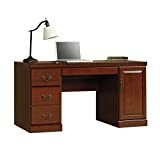 Adding vintage and cottage effect to this unique X shaped pattern desk, it has also come with an additional compartment for storage needs. 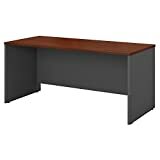 An all-natural product, the Ameriwood desk has a broad open surface to keep all your office essentials such as your office files, laptops, and stationery items. 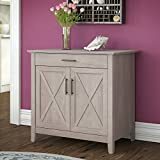 Available in the dimensions 29.5h x 66w x 19.5d, this credenza desk requires assembly and has a specific brownish gray color to complement your décor. Available in Classic Cherry color, the Sauder Heritage credenza desk is truly a magnificent masterpiece. Along with a small pullout drawer, this desk is capable of holding files and folders having the standard letter size. It also has a shelf for storage purposes, a grommet hole to charge your electrical appliances and a panel with a power strip. This heritage hill is an ideal gift for a new office room or a compact workspace. Another product by Sauder, the Palladia credenza desk is available with an adjustable shelf for keeping your keyboard or printer. It also comes packed with a charging port cord to charge mobile phone devices easily. It also has internal storage for additional tools and accessories in the form of drawers behind doors. This credenza desk is available in wind oak color and also has an extra ball bearing slides to provide a perfect experience of a workstation. The cherry finish colored Sauder Palladia credenza desk is an 86 kg large desk, which does feature almost the same features as the other Sauder desks, but with a better look. It has a shelf behind doors for storage purposes, a cording system to charge your electrical appliances and ball bearing slides for ease of use. The best entry on our list, this credenza desk is similar to our seventh pick but is much better due to its compact dimensions comparatively. Likewise, it can be combined with the other series C Bush Business Furniture Credenza Desks to form new U and L-shaped workstations configurations. It is also expandable with spare parts sold separately and also has a thermally fused surface to prevent any dents. 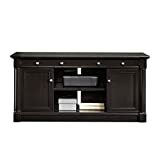 Make sure always to choose an excellent high-quality product while purchasing a credenza desk. Also, keep in mind the space and adjustability of the office room before considering one.